One of India’s most celebrated national parks, Bandhavgarh National Park is located in the heart of the country in the Umaria District in Madhya Pradesh (also checkout: best national parks in Madhya Pradesh). With an area covering around 450 square kilometers with Sal trees and bamboo clusters, it is home to the Royal Bengal Tiger, a few of whom have achieved cult status. ‘Charger’ was the name given to the alpha male in Bandhavgarh because he was known to make mock charges at gypsies and elephants on safaris though no one was ever hurt. 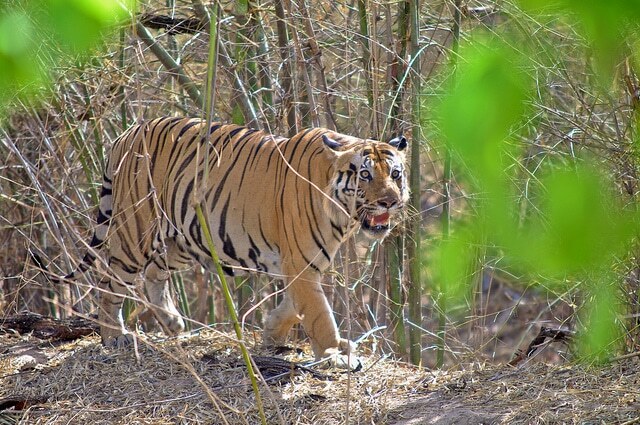 Sita held the distinction of being the most photographed tigress in the world till date. Though both Charger and Sita died years ago, their legends are kept alive by tourists and guides who remember them with fondness and awe. Overlooking the park is the Bandhavgarh Fort, a sentinel estimated to be 2,000 or more years old. Blending into the mountainous landscape and barely visible to a casual onlooker, the fort stands tall and proud, a self-appointed guard to one of the most densely populated tiger habitats in the world. Bandhavgarh was once famous for its white tigers though many claim they are now extinct. Rich in flora and fauna, Bandhavgarh National Park is also a haven for ornithologists with over 250 species of birds reported seen here. Nestled between the Vindhyas and the Satpuras, two distinct mountain ranges, Bandhavgarh is unique in its topography and captivating in its natural wealth. Apart from the Royal Bengal Tiger, Bandhavgarh is known for the Indian Bison or Gaur. Though the Gaur was known populate the national park, they were said to have become extinct in the late 1900’s and were soon relocated from nearby Pench. Bandhavgarh experiences sweltering heat in the summer months with temperatures reaching 44 degrees C around the months of May and June. Monsoons start cooling off the park around June building a thunderous tempo as it eases off by the end of the season. The average annual rainfall here has been recorded at 1133 mm. Winters can see scattered rainfall due to the southern cyclones. By mid November, the park cools off considerably with the mercury dropping down to 20 degrees C and less. The park is open from mid-October to June each year. From November to February, the weather is cool and is thus favored by many. The forests are at this time still lush and green and dense after the monsoon showers. However, the months of March, April and May are believed to best for tiger sighting as the forest dries up with the approach of summer. Apart from the star of the park, the tiger, Bandhavgarh offers a stunning variety of wildlife including the Indian Bison or Gaur. Leopards are present, though because of the presence of tigers, they are pushed to the fringes of the park. Cheetals or Spotted Deer are in abundance and so are Sambhars. Barking Deer, Barahsingha, Nilgai or Bluebull, Indian Wolf, Hyena, Caracal and Common Langur make up this diverse ecosystem. There are 350 species of birds including the Plum-headed Parakeet, Coppersmith Barbet, Indian Grey Hornbill, Orange-headed thrush Alexandrine Parakeet, Indian Roller, Oriental Magpie Robin, Eurasian Collared Dove, Yellow-footed Pigeon, Sapphire Flycatcher, Brown Fish Owl, Crested Hawk Eagle, White-Rumped Vulture, Golden Oriole and Painted Francolin to name just a few. Bandhavgarh National Park is well connected by road and railways. It is about 519 kilometers from Bhopal, the capital of Madhya Pradesh and around 207 kilometers from Jabalpur. The nearest airport connected to Bandhavgarh is Jabalpur Airport, about 200 kilometers away. The nearest railway station is Umaria Railway Station, 35 kilometers away and Katni Railway Station, at a distance of 102 kilometers. One can travel via Jabalpur (200 kilometers) or hire a cab from Katni (102 kilometers) away. Alternatively, take a cab or jeep from Umaria, approximately 35 kilometers away. Since Bandhavgarh is a major hub for tourists and wildlife lovers, there are many hotels and resorts with different budgets to suit everyone. The Forest Rest House is usually reserved for department officials and other VIP guests. INR 2,200 per person for Indian nationals including guide and vehicle and INR 4,300 per person for international tourists.